Join Scene Change Theatre Company’s schools project to create a “Play in a Day.” The day will include educational drama workshops, music and a costumed performance for the school to watch. 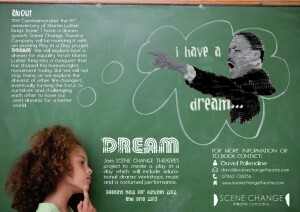 DREAM was created in 2013 to commemorate the 50th anniversary of Martin Luther King’s iconic “I have a dream” speech. We explore how a dream for equality thrust Martin Luther King into a conquest that has shaped the human rights movement today. But we don’tstop there as we explore the dreams of other life changers, eventually turning the focus to ourselves and challenging eachother to have our own dreams for a better world. Click on Booking information and Costings to get an idea of prices for the project. However we are open to negotiate prices where appropriate.